Andrea and Hugh combine the classic sounds of flute and piano to give your event a special touch of class. Covering a vast territory of music, from the beautiful melodies of Bach to the smooth harmonies of Bacharach. 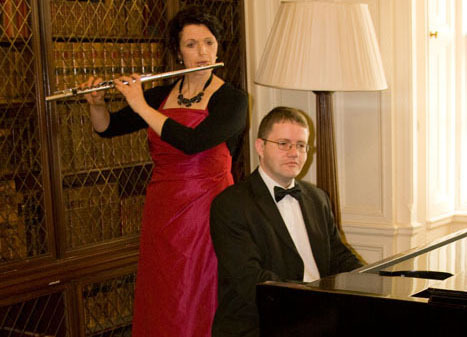 Andrea and Hugh combine the classic sounds of flute and piano to give your event a special touch of class. Covering a vast territory of music, from the beautiful melodies of Bach to the smooth harmonies of Bacharach, the repertoire is hand-picked by both to reflect their own personal favourites, as well as your own, bringing the warmth of personal enjoyment to their playing. Aiming for musical velvet, the Arcadia Duo is suave and sophisticated and sure to bring your guests together inspiring lasting happy memories of your day. We’re just back from our honeymoon, and the dust is finally settling, so I thought I’d write to say thanks again for making our day so special. I know some of the music we put on our list was a bit unusual, but you... Susan (and Martin) Smith! Wow, what can I say? Me and Lesley had such a cool day. Short notice or not, you and Hugh had it all under control. Phew! My mum loved your Bee-Gees by the way! Gina. A selection of classical music.